Can I convert AAC to MP3 online? Compared to AAC, MP3 is a standard Audio File format which is supported by all the popular media players as well as devices. If you are unable to play AAC file in your device, you can convert it into MP3 format for more flexibility and compatibility. AAC is capable of handling both lower and higher sound frequencies. It supports low bit-rate compression. AAC is similar to MP3, and both of them support minimal loss of audio quality. Thus, the conversion from AAC to MP3 is possible through various online tools or Audio Converters. Now, let us have a look at the top 10 AAC to MP3 converter online in the market. iSkysoft Video Converter Ultimate is an easy-to-use AAC to MP3 Audio Converter. It can perform super-speedy Audio Conversions with original audio quality. You can also enhance the AAC Audio quality before conversion. It Supports all the Audio formats such as MP3, FLAC, CAF, OGG, AAC, WMA, AIFF and so on. It can be used in any manner you want, such as MP3 Converter, FLAC Converter, WMA Converter, Video to Audio Converter and so on. Moreover, users can extract audio from video files and convert it into MP3 File format easily. IMedia Converter supports unique functions and tools to make your experience better with each conversion. It is one of the fastest, efficient and reliable Audio converting tools in the market. 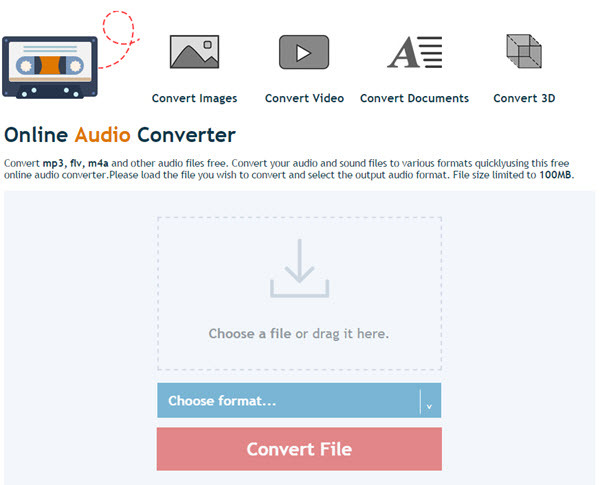 Efficient & Effective Audio Converter: Takes minimal time for conversion of audio files. 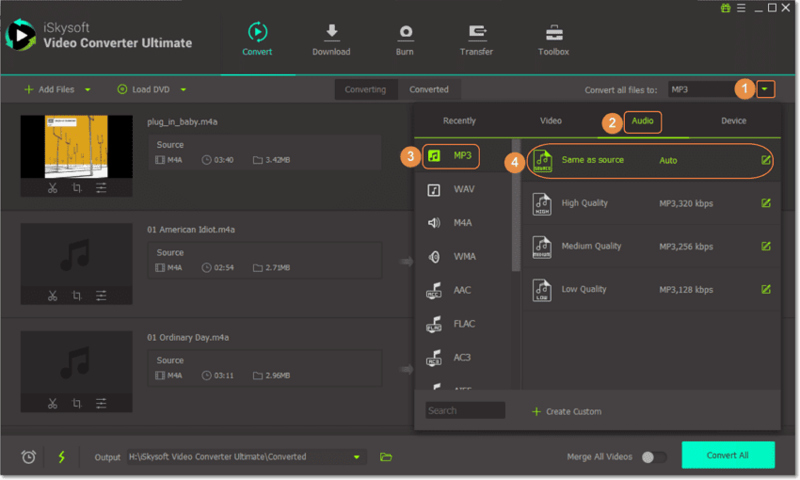 Flexible and Compatible: With its Optimized Pre-sets, you can convert Audio files to be compatible with any device or platform as per your requirement. Best MP3 Converter: Convert any Audio Files to MP3 file format with ease. Best Audio Editing Features: Merge Audio files, Adjust Volume, Trim, Change Audio Codec and so on. Batch Convert Audio Files within Minutes. File Zigzag is one of the best AAC to MP3 Online Converters. It supports all Audio Files formats such as AAC, MP3, AC3, AIFF, FLAC, AIF, AIFC, AU, M4A, OPUS, RA, MMF, OGG, WMA and so on. 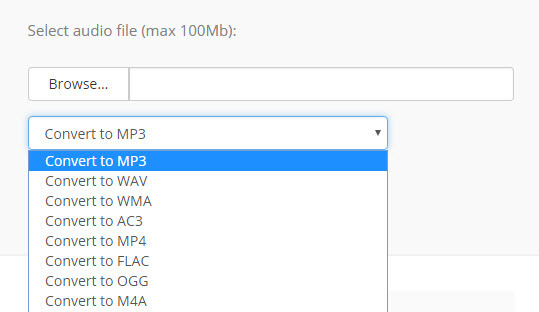 It is a free online Audio converter where you just have to select AAC files from your computer and then select MP3 as output format. Enter your email address to receive the converted MP3 file. It also supports multiple conversions of AAC files or other media file formats. File Zigzag has proved to be one of the fastest online converters in the market. Very simple to use and Convert Audio Files. Batch Convert AAC Audio files to MP3. Provides 100 % web-based services. It processes conversion in 4 easy steps. Time required for uploading Media files is high. Cannot Download Converted file directly as it will be spent via email. File Conversion Online AAC to MP3 Converter is a very simple audio converter. It supports other file extensions such as MP3, OGG, AMR, DAUD, MP2, VOC, AC3, ALAC and so on. You just need to select AAC file and convert it into MPEG 1/2 Audio Layer 3 (MP3) file format within minutes. Supports 16 Audio File Formats. No Additional Tools or Features for enhancing the Audio File. Media iO is a unique Audio Converter which supports more than 150 Audio/Video Media formats. Moreover, this site can be accessed in more than 16 Languages such as Deutsch, Malay, English, Italiano, Chinese, etc. It is best known for its MP3 Conversions, 3GP Conversions, WAV conversions and so on. It is one of the popular online converters for converting AAC files into MP3 Format within seconds. Users can also download YouTube Videos and Convert them into MP3 format easily. Audio Converto is one of the simple online audio converters which can convert audio files such as AAC, WAV, M4A, FLAC, OGG, AC3, MP3 and so on. You can easily convert AAC Audio files into MP3 and also perform other conversions such as MP3 to WAV, MP3 to MP4, MP3 to AAC, AC3 to MP3 etc. Simply select AAC audio file and click ‘Convert File’ button to convert your target audio files. Best Suited for MP3 file conversions. Supports more than 10 Audio File formats. No Extra Features or functions to edit Audio files. Office Converter is one of the best Online Audio Converters which supports all the Audio file formats such as WAV, M4A, AAC, MP3, FLAC, OGG, WMA, AIFF, MP2, AC3 etc. Any Free user can upload and convert up to 10MB Audio files only. While registered users or members can upload more than 1GB Audio files. However, registration is completely free. You can convert AAC Audio files by using 3 methods such as Upload Files from Computer, download from YouTube or Enter URL and Convert easily. Supports Batch Conversion of AAC Files to MP3. Supports more than 50 Media File formats. Supports YouTube to MP3 Conversions. Directly convert AAC files via URL. Maximum upload is only 10MB. Zamzar is one of the online converters that you can sue to convert AAC to MP3. It is an audio converter that supports 21 audio file formats such as AAC, MP3, OGG, APE, AIF, M4A, M4B, WAV, WMA and much more. To convert the file, you need to upload it from your computer. You can also paste the URL of the file to search box. From there, you need to select the output format then enter the email address that the converted file will be sent to after it is converted. Other than audio conversion, Zamzar is also an image converter, document converter, video converter and eBook converter. It supports several file formats. It is a credible online converter. The maximum file limit is 100MB. It is conversion speed takes up to 10minutes for large files. You can also try Conversion-tool.com to convert AAC files to MP3. It is a reliable audio converter that supports audio formats like AIFF, MP3, FLAC, M4A, WAV, WMA and OGG. You can upload a file from an online site or select it from OneDrive or Dropbox. Converting with this site, you will be able to change bitrate settings. Conversion-tool.com also converts eBooks, Documents, PDFs and MIDI. To get the downloaded file, you need to provide an email address. 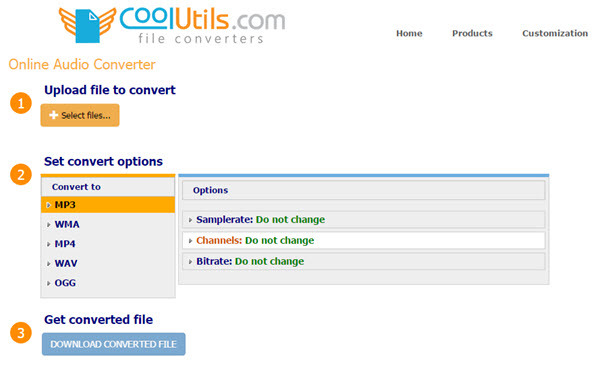 CoolUtilisl is another online converter that you can use to convert that supports conversion of AAC to output formats like MP3, WMA, WAV, OGG, and WAV. CoolUtilis allows you to upload files from Google Drive, Computer and Dropbox. You will then select the output formats and convert the file. Unlike Zamzar you don’t have to provide an email address to receive the downloaded file. You just download it from the interface. CoolUtilis also offers conversion of images, PDFs, Documents, videos, webmail and CAD. The website provides you with knowledge of the file formats. It allows you to change bitrate, sample rate and channel of audio. Its user interface supports 13 languages. Its file size limit 100MB. Another ACC to MP3 converter is Bear File Converter. This web-based converter supports conversion of audios, documents, eBooks, images and others. 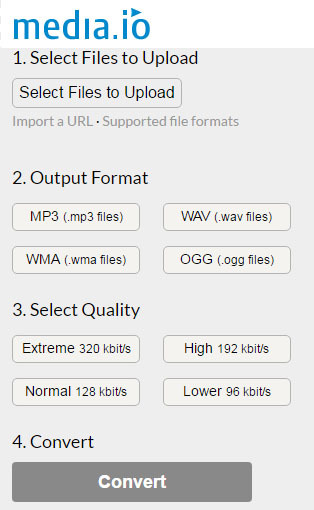 For audio conversions, it supports file formats like MP3, OGG, APE, WMA, M4A and much more. It supports many audio formats. It allows you to change audio sample rate and channel. The file size limit is 50MB. Swift is another online converter with a friendly user interface. From the home menu just click on the audio tool conversion and upload your AAC file. It will convert to several audio formats not limited to MP3, APE, AIFF, AU, WMA, M4A and OGG. It is a free website that also supports conversion of images, documents, videos and 3DS. It is fast compared to other online converts. The file size limit is 100MB. MP3 Conversions are the most trending conversions in the website. People usually choose to convert via online Audio converters to save time. However, you cannot perform any function beyond conversion of audio files. It is very essential to choose the right AAC to MP3 converter, so that you can edit Audio files, Merge/Combine, Enhance or Convert with original audio quality effectively. Try iSkysoft Video Converter Ultimate and experience the surprise it brings to you!